Since his teens, James Lauer has been studying the Bible. Where others have struggled to parse its meanings, he has found clarity. He wants to write a book that will explain it all. The only thing he needs is $1,000 ($20,523.57 USD 2005). 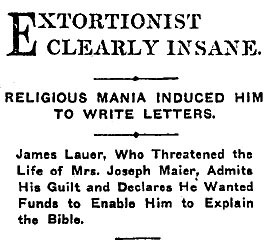 During his studies of the Bible, Lauer has apparently never encountered anything prohibiting extortion, so to get the money, he has been writing notes to Mrs. Joseph Maier Sr. One was not enough, so Lauer wrote a series of letters demanding money and threatening her life if she didn’t pay. At the moment, Lauer is in the City Jail under examination by Dr. Quint. Neither Lauer’s conduct nor his appearance is reassuring. 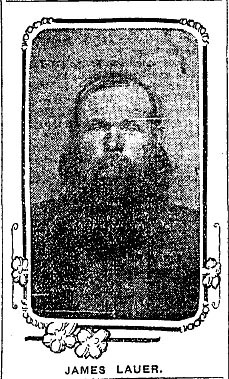 “His long red hair and beard are unkempt, his flat-topped skull is peculiarly formed and his painfully strained gaze does not indicate a well-balanced mind,” The Times says. “During his imprisonment in the City Jail, Lauer talked wildly of his plans for writing a book about the Bible which would clear up all the misunderstanding. He repeatedly declared that while all attempts to explain the Bible have failed, it is quite clear to him, and that he could explain it perfectly to others if he were given opportunity to write his book.